Born in Iida City, Nagano Prefecture Japan ,Nov.14. After Mastering the theory and practice of pottery without a teacher, set up his own kiln in Tokyo. Elucidated the mechanism of Yohen - iridescent - ware , a technique which had been lost through the ages, and thus succeeded in making more varicolored ceramic ware. The Kazuaki Kita Sculpturesque and Ceramic Arts Exhibition toured North America under the sponsorship of the Committee to bring a Kazuaki Kita One-Man Show to North America invitation Committee, led by M. Lowenthal, John Somervill. The exhibition travelled to major cities in North America, including a special solo exhibition at the Brooklyn Museum, New York,1983 and an exhibition at the Art Gallery of Greater Victoria B.C. Canada, 1985. Nominated for the Nobel Peace Prize by intellectuals and museumrelated people in the United States of America and Canada. Fire were divided from the sacred fires of Hiroshima = Fires of "CHINKON", of Hiroshima and used to Fire each ceramic Piece of Nagasaki in Toushougu shrine, Tokyo. The fires were ignited in The Kiln which Kita made and "Death Mask" was baked, (broadcasted by NHK TV Morning Wide). 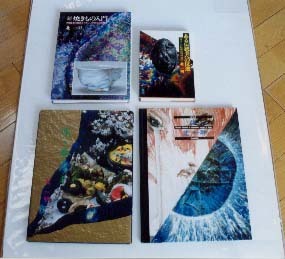 Since that moment, it has been Kazuaki Kita's Kiln of "CHINKON's Fire" of Hiroshima and Nagasaki symbolizing New era. Kazuaki KIta Exhibition of Creative Beauty held at Shanghai Art Museum(sponsored by Cultural Affair as Bureau, Shanbhai). Nominated as an advisory professor of Shanghai Teacher's University. "The Research Center for Kazuaki Kita's Creating Comprehensive Study" was founded in Shanghai Teacher's University. Kazuaki Kita Exhibition of Creative Beauty held at Chinese Revolution Museum, Beijing. Nominated as an Honorary Citizen in the City of Harrisburg, PA' USA. The Nezu Museum(Tokyo), Gotoh Museum(Tokyo), The British Museum(London), The Victoria and Albert Museum(London), The National Museum of Sevres(Paris), The Hermitage Museum(St. Petersburg), The Barcelona National Ceramic Art Museum, The Boston Museum of Fine Arts, The National Place Museum(Taipei), The National Museum of Korea, The Shanghai Museum, The Brooklyn Museum(New York), The Art Gallery of Greater Victoria (B.C. Canada),and other famous museums in over 30 Countries.